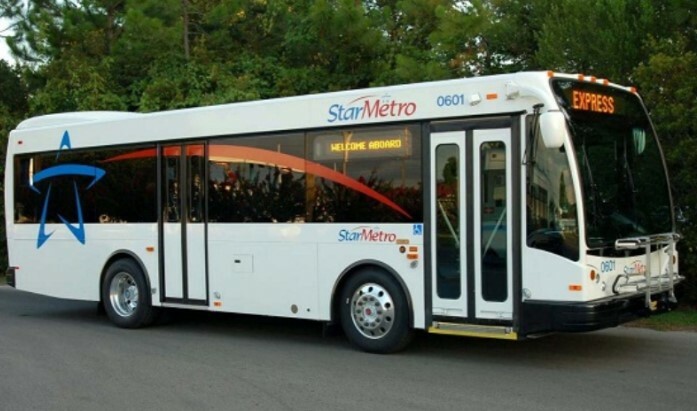 Records requested by Tallahassee Reports shows that citizens using StarMetro declined in 2018. The latest information provided by the City of Tallahassee shows that in 2018, StarMetro ridership declined 3.33% from 3.402 million passenger trips in 2017 to 3.289 million passenger trips in 2018. The decrease in passenger trips has become an annual trend. Records show that the number of StarMetro passenger trips have declined each year since 2010. See chart below. In 2010 there were 4.946 million StarMetro passenger trips. 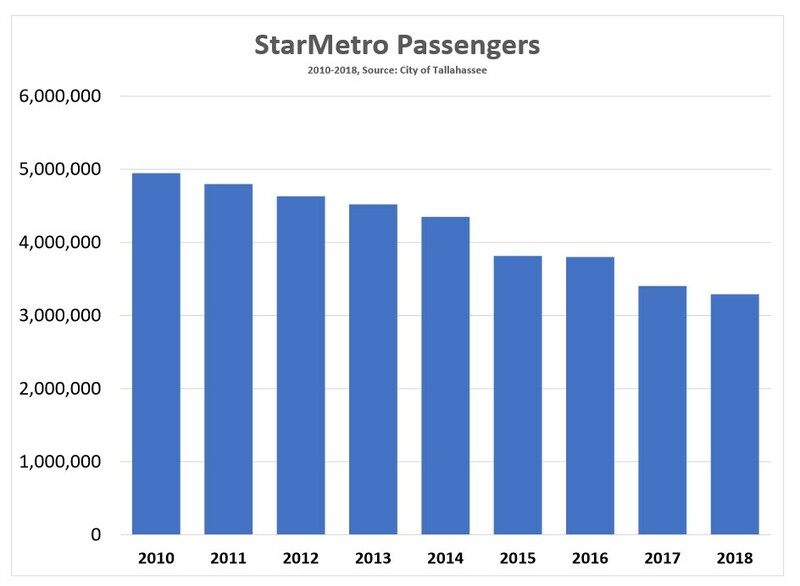 Based on 2018 numbers, the number of annual StarMetro passenger trips has declined 33.5% during this eight year period. Also, the decline in passenger trips is driving up costs. Based on the latest available transit data from the US Department of Transportation, StarMetro costs increased 28.7% from $3.31 per passenger trip in 2013 to $4.26 per passenger trip in 2017. 10 Responses to "StarMetro Ridership Declines in 2018, Costs Increase"
Dang-nabbit this whole decline in bus riders is all Donald J Trumps fault. Had that pesky Trump not improved the economey, eliminated unemployment, and empowered so many to go out and buy cars this bus rider decline would have never happened. Oh how we miss the tanked economey of the Obama failed administration. Being told how wrong we are every day…that pants crease, those giant ears, cash 4 clunkers, shovel ready job money diverted to corrupt unions, ect…ect…sniff sob We Miss Him!!! So, we taxpayers are billed at least $4.26 for every $1.25 StarMetro makes on a rider’s fare? What kind of a business model is that? Is there a federal subsidy that reduces this expense? I’d sell all the standard size buses except two or three. Use them on the heaviest routes. Replace the rest with buses half the size, like the Big Bend Dial-A-Ride uses. I think Uber is cutting into StarMetro. Also, why do no bus routes go to the airport? I’m guessing the taxi drivers blocked that a long time ago. Another example of a failing economic program being “forced” into existence and persisting despite losing (and wasting) huge amounts of taxpayer dollars. Anyone with common business sense would scrap the Star Metro program in it’s present form and replace it with something scaled waaay down that at least pays most of it’s own expenses, with only minor subsidies required to maintain the service. First off – the buses are too large, carry very few passengers, and block traffic and streets in many places. Replace (sell, not give away) most of the buses with smaller passenger vans that carry 10 to 15 people – all running on clean natural gas if you simply must maintain a “green” aspect. I agree with the commenter who suggests the large buses only be used on major routes or the busiest. Either do that or reduce the existing Star Metro to the point where it earns it’s own upkeep, and stop throwing taxpayer money away. When will Liberals learn that you can’t just decree a Leftist Utopia into existence with programs, policies, and laws that clearly don’t work in the real world, either economically, socially, Constitutionally, or all three. You may as well “decree” that gravity doesn’t exist in your city or state – it won’t work or make any common sense, but it sounds nice to those loons that want to fly and will vote for you if you say you’ll make it happen. Waiting for AOC to announce that any day. First, do away with the Down Town Trolley’s. I am at the What-A-Burger on a Couple Saturday Evenings a Month and many of us Count how many times they pass by and 99% of the time, they are Empty, that 1 % there maybe 1 to 3 People on them. Second, all Routes that rarely have a total of 15 People on board at any given time, they need to drop down to the small Buses like the “Dial-A-Ride” uses. Those Buses get better Mileage and are cheaper to maintain. Both of these suggestions are Money Savers. Here’s another great Maven idea: Have 3-5 “Express” runs in the morning/evening rush hours from the Bradfordville region to the state offices at SouthWood and the Capitol. The full-size buses could stop at the T’ville Walmart, Publix and/or the big Baptist Church lot and go from there south on Capital circle to Southwood. Or to the Capitol. Just negotiate a deal with the three businesses to use the far corners of their parking lots for the riders’ cars. They always have lots of empty parking there. Reverse the process at night. Heck, the two shopping centers may be thrilled to have a few hundred riders get dropped off in front of their stores in the evening, and may green light it for nothing. That would relieve some congestion on T’ville Road. Any figures or costs supplied including ridership are completely and totally fabricated. Then figure in the cost of a single bus ($180K? 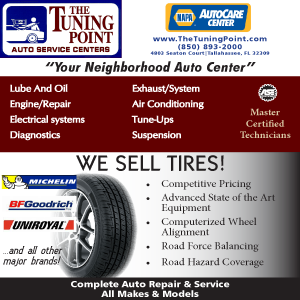 ), the mechanics, drivers, shop, fuel, etc. it is an out of control financial boondoggle! Add in bus stops, canopies, big belly garbage compactors and the running of the Steele Plaza! Now add in the $35k Rosa Parks Statute…..; now Check into the $20K Favors plaque and stand at the FAMU storm water pond – courtesy of Cynthia Barber misappropriation of Funds; this is how tax payer money is pjssed away…. Wasn’t that the model of the 80x? I don’t believe a park and ride will work in this town. By the time one drives, parks, and waits, they could be almost to, if not at, work already. The bus volume just isn’t there to warrant people to want to ride. I see it as Star Metro having to pull an Amazon. Over saturate the market with buses and low fares and once it takes hold then creep up prices. However, they missed the boat and have a reputation. I do not believe it can be fixed. Reduce the size and number of buses, limit routes to high demand. Commuter routes to town in the mornings, back to the suburbs after work. Commuter parking at bus stops. Improve pickup service to handicapped.